• A high quality, medium weight, Cut Away backing. • Great for medium sized designs. A high quality, medium weight, Cut Away backing. Use with knits and loosely woven fabrics. Great for medium sized designs. 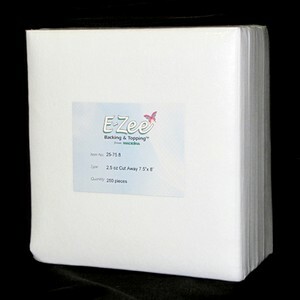 E-Zee Cut Just Right 2.5 ounce is a medium weight, Cut Away stabilizer. It has a soft hand and is great for use with medium stitch counts and medium density designs. This economical stabilizer works well with one or two pieces. Use with medium weight fleece, knits and stretchy fabrics. Cut Away backings should be used for unstable and knit fabrics. E-Zee Cut Just Right 2.5 ounce is a medium weight, Cut Away stabilizer. It has a soft hand and is great for use with medium stitch counts and medium density designs.